During CarverFest I had no digital front end in my EAR/Fosgate rig. I spent the 14 days running the Ariston/Linn/Grado combo, although it wasn't without issue. I seem to need a rumble filter to combat woofer flap, or better system isolation and once Bob sorted out my phase problem....the rig sounded great! I had a speaker wired incorrectly and hadn't taken the time to sort out the problem. I knew it sounded wrong but couldn't put my finger on the fix. George Daniel gave me 'the holy grail' of 6X4s to install in my Fosgate Signature phono and we gave it a whirl breaking open a couple of Beatles LPs I bought in the early '80s, nothing like virgin vinyl to give perspective to a listening session. I placed the K&K SUT back in the rig to get a bit more gain and it worked really well. The K&K belongs to Dan(Chauss). He was kind enough to loan it to me while I got my vinylphile ducks in a row. Bob spent some time listening to my rig one evening at the 'Fest and suggested instead of a new cart I buy an SUT giving me a bit more flexibility when choosing a new cart and allowing me time to run this cart while I take care selecting a new one, if I really find the need. Bob read through the literature I brought along for the EARV20 and the Fosgate Signature. 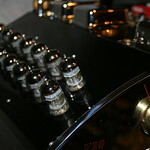 He seemed quite surprised at the techniques employed in the V20 surrounding the use of 12AX7s as power tubes. George suggested a Cinemag CM-QEE-3440 SUT and I trust his ears. So Cinemag it is. Hope it works out well for you Ray! Wonder if this'll go cheap enough to consider? The adjustability could come in handy. You should able to find out more on the CJ reference site that comes up with a search. Sell it and buy the C-J! Monkey Ward...hadn't thought of them in years. The CD changer I have in my office rig is a Technics unit I bought for Sherry back in the early 90s at Montgomery Ward. Kinda miss them. I installed a set of PSvane valves throughout the Fosgate Signature pre. Damn, they look really good and I'll sit down after they get a few hours on them and let y'all know what I think.